The World Wide Web would be nothing without web servers, and Apache has been king of that hill for a long time now. Although its market share has been slipping a bit in recent years, Apache came back with a vengeance in 2010. This became abundantly clear as we examined the growth of the top five web servers during the past year, from December 2009 to December 2010. As you’ll see, Apache really had a great year. By the end of 2010, the Internet had a total of 255 million websites. Compared to 2009, that’s an increase by 9%, or 21.4 million websites. So basically, the Web keeps growing by leaps and bounds. It would have actually been a much higher number by 30 million or so if it weren’t for the fact that the Netcraft’s December 2009 number included the blogs from Tencent’s QQ, which are no longer included in the survey. Apache went from hosting 109 million websites in 2009, to almost 152 million by the end of 2010. Net result: Almost 43 million new Apache websites in 2010. Microsoft IIS went from hosting 49 million websites in 2009, to almost 57 million by the end of 2010. Net result: Almost 8 million new IIS websites in 2010. Nginx failed to show the same explosive growth as it did in 2009, going from 16.2 to 16.9 million websites in 2010. Google’s web server (primarily for Blogger) went from 14.1 to 14.9 million websites in 2010. Lighttpd went from 840 thousand to 1.3 million websites. You can clearly see how strong the past year has been for Apache. The number of Apache-hosted websites has grown by almost 40% in just one year. Apache went from 46.6% to 59.4%, a massive gain of 12.8%. Microsoft IIS went from 21.0% to 22.2%, a 1.2% gain. Nginx went from 6.6% to 7.0%. Google’s web server went from 6.0% to 5.9%. Lighttpd went from 0.4% to 0.5%. Just as the chart indicated, while the market share of IIS and nginx grew only moderately, Apache got a big boost. This article shows that Apache is pulling away from its “arch enemy, ” Microsoft’s IIS. In December 2009 there were 2.2 times as many Apache websites as there were IIS websites. In December 2010 Apache had 2.7 times as many websites as IIS. Apache is arguably one of the most emphatic open source successes, a product that has consistently since its birth been the preferred web server for millions upon millions of webmasters. Unless something drastic happens, it will remain dominant for a long time to come. Why isn’t there any section in this article that explains the reasons behind this change? I would attribute it to the popularity of passenger fusion for apache, as a solid option for rails deployment. There looks something wrong with the 2009 market share figures – they only total 80.6%. If Apache gained market share, that share had to come from somewhere – looks like it would have come from IIS and the others. @Judo: You’re right in that the 2009 numbers do seem a bit off. Most likely this is the result of the QQ sites appearing (included in Netcraft’s survey), then disappearing in 2010. Actually, that also explains some of Apache’s growth in Netcraft’s market share numbers, but far from all of it. Would be really interesting to see what percentage of Apache’s gain constitutes “real” websites. Tens of millions of domains are “parked”, doing nothing but being pointed at an ad-ridden page hosted by one of the big players like GoDaddy, parked.com, buy.com, etc. A couple of those guys can really skew the numbers. Apache is an old friend and I’m glad to see it thriving. Nginx is a new friend though doesn’t lend itself to large shared hosting environments where things like .htaccess are a necessity so it’s perceived market share will probably always appear low. Thanks for the report! Would be interested in any anecdotal data like, how do the numbers match up when considering unique IP addresses or less than $n hosts on a specific IP, etc. How about market share based on total pages served? A single high traffic site might serve more traffic than millions of others combined. 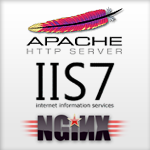 Apache is way ahead of IIS.in 2011 Apache is going to defeat IIS.I think now war will be for second spot and Google Webserver and Nginx will give tough fight to IIS. I’m not good at statistics, but can somebody explain how Apache can grow by 43 million websites, while there where only 21.4 million new websites in 2010? @anon: As stated in the article, the Dec 2009 numbers from Netcraft included about 30 million blogs from QQ which were not included in 2010. So if we cleanup the above data. Apache grew from 109+30=139m to 152m websites. Growth of 9%. I believe you should update your article a little. @anon: No, that’s incorrect. According to Netcraft, QQ didn’t use Apache (it had its own server category) and it was not included in Apache’s stats. Surely, Apache can’t match Microsoft’s profits in volume. Apache is king! Microsoft is rolling in the dough though! So, is WordPress.com blogs counted as one each or just lumped into one? They use ngin and they have 32M blogs. I think another reason why apache keeps on growing is because it is the default webserver for most of the linux flavors. And most webhosting companies uses apache as it works very well with cpanel. I hope NGINX become more popular in the near future. That webserver is just faster than apache but the setup is just not as easy with apache. Just figured I’d point out a typo. In “here is how the market share for each web *browser* changed in 2010” you really mean “web *server*”. @Alejo: Haha, that’s one big typo. Or more of a brain fart. 🙂 Fixed. Thanks for the catch. i think this begs the question… how many instances of apache are running on windows? @kwatog, I’ve found that nginx is actually much easier to deploy than apache, and have switched to nginx for all webservers that I manage.